Ganja-La Chuli Peak is fiormerly known as Naya Kanga (5,844 m), rises to the west of Ganja La, and is a popular but difficult mountain to climb. The normal route to Nayakanga peak passes through the snowy north east ridge. The technical difficulty of the climb is rated at Alpine Grade PD+. This is mainly a function of three things: the fact that you are on significant snow slopes for most of the journey above camp 1; some crevasses as you turn west below the Ganja La; and finally the short ridge section to the summit. The summit can be gained in two days from Kyanjin with one camp at Base Camp or Nyengang Kharka, or alternatively in three days with a second camp at High camp just below the Ganja La. The most important reward of climbing Naya Kanga is the spectacular view of Langtang Mountains as well as Helambu mountains range including Dorje Lakpa and others. Moreover, also closely visible is the north side Tibetan mountains, including Shisapangma at 8035 meters. Trekking starting from Syabrubesi after a 7/8 hour drive from Kathmandu, we spend three days hiking the beautiful Langtang valley to Kyanjin Gompa at 3800 meters. Kyanjin Gompa is situated below Langtang Lirung (7,246m) and spend one day acclimatizing taking day-hikes in spectacular surroundings. After the climb we return to Syabrubesi and drive back to Kathmandu. 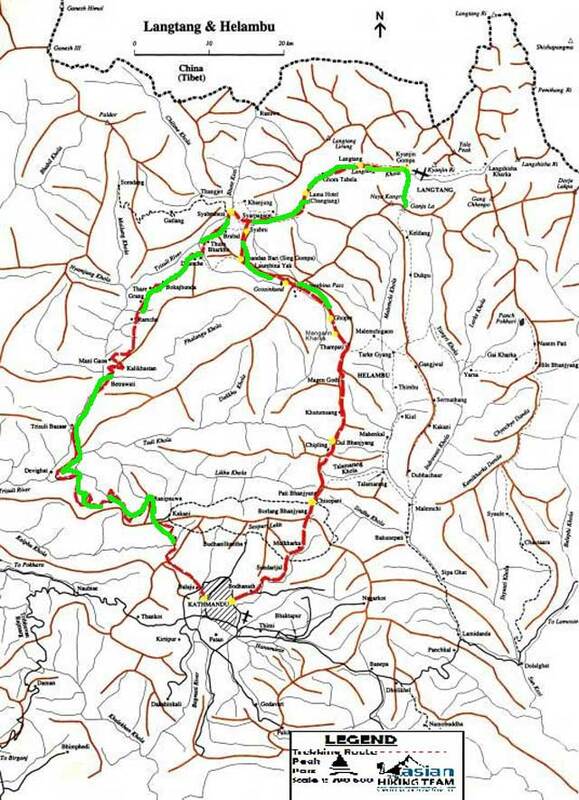 It is also possible to cross Ganjala pass and end your trek in Helambu, Melamchi Pul Bazar. Day 02: Kathmandu full day sightseeing, climbing preparation day. Day 10: Naya Kanga (Ganja-La) Climbing Period. Tented Camp. Day 11: Naya Kanga (Ganja-La) 5844m. Summit and back to Base Camp. Tented Camp. Day 12: Base Camp to Kyangjing Gompa. Tea-house Lodge/Tented Camp. Day 13: Kyangjing Gompa – Lama Hotel. Tea-house Lodge/Tented Camp. Day 16: Last minute, transfers to airport for your final departure or next trip. All Land Transport to/from Trek start and end. Climbing preparation day so that check your equipment, meet guide and staffs, collect climbing permit. If you are interest to visit Kathmandu, let us know, overnight in Kathmandu. Drive early morning drive to Pashang Langbu Highway, Trisuli – Dhunche - Syaphru Base (1460m); 6/9 hours. Rest of time exploring around the valley or Chileme Hydro Power project, Overnight Hotel. Start trekking on foot crossing the Bhot Khola river ans very soon within 2 minutes again cross Langtang Khola. Following Khola into grassland to reach dovan and Pahiro. May we have lunch if you are hungry otherwise continues walk inside jungle. very much possible to see hug monkey and others wild animals. One hours walk to reach Bamboo. The trail continues follow the up river valley than cross the Langtang Khola and steeply climb to reach Rimche 1/2 hours. Another half an hours to reach Lama Hotel. Originally its call Changtang, 2340m. Overnight in Lodge. You can see scenery of Jungle and landscape follows the Langtang Khola. After breakfast, trek start around 7/8 O'clock. First part trekking into jungle following the Langtang Khola. Crossing the Gumnachock, Chhunama, Ghodatabela where is national park office in Ghodatabela. We need chick permit and continues climb Chyamki and Langtang village (3420m), it takes 5 hours see the view of Langtang range, Sherpa Monastery and Sherpa Village, overnight in Lodge. Today is rest day so a day trip around Langshisa Kharka 4160m 4/5 hrs both way or climb Cherko Ri (4984m) 5 hours both way, or visit Ganjala pass or NayaKhanga valley, or enjoying the view from hotel and Yak Cheese, overnight in hotel/Lodge. Day 08: Kyangjing Gompa – Naya Kanga (Ganja-La) Base Camp. Tented Camp. After breakfast start trekking all the way to air strip, dwon to rive bank, cross the Langtang Khole. Now need to climb all the way with pine and fir forest. Heading to Nanya Khanga base camp. Overnight in Camp, 4/5 hours. Day 09: Naya Kanga (Ganja-La) BC – High Camp. Tented Camp. Today the distance is very short climb to High camp of Naya Khanga 3 hours, overnight in camp. Day 10/ day 11: Naya Kanga (Ganja-La) Climbing Period. Tented Camp. Early morning start climb the peak, return to Base camp. overnight in Camp. Note: here we design one day spare day incase of weather or any couse to disturb climb. All the way return to Kyanjing Gomba, overnight camp or lodge, 5 hours. All the way to Syabrubesi as same as before, take 5 hours, over night hotel. Take early morning bus/Jeep to Kathmandu 6/7 hours drive, transfer to hotel, overnight Kathmandu.